John F. McKim, age 82, passed away October 9 in Laguna Woods, CA. Born August 16, 1924 in Hollywood, CA, to Claude Gordon McKim and Rachel Blanche McComb, he was raised in Inglewood, CA. He volunteered for the U.S. Coast Guard reserve and was called to active duty in November 1942. He served as a Boat Coxswain in the Pacific theater during World War II. He attended UCLA, where he met and married Lillian Carr, graduating in Fine Arts in 1952 and in 1953 started his family, making his home in Long Beach, CA. In 1975 he married Margaret Joan Isley Fischer, his inspiration and the love of his life. His career endeavors included registered building designer and architectural specifications writer and engineer, an active professional outdoor writer and illustrator and a successful book author and magazine columnist. 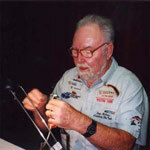 His book Fly Tying…Adventures in Fur Feathers and Fun is one of the best instructional books available on the topic. His monthly column, Fly Ideas, has run in Western Outdoors magazine since 1978. He was an avid fisherman and fly-tyer, and a long time member of the Long Beach Casting Club. As a member of the Diablo Valley Fly Fisherman, he was presented the “Member of the Year” award in 2001. 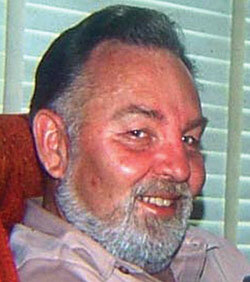 Most recently he was a member of the Rod and Gun Club of Laguna Woods.